The AGC Safety Council provides a forum for the discussion of current safety and health issues affecting the construction industry. The forum focuses on the education of its members and sharing new developments in the field of safety. Meetings are held the 4th Tuesday of each month, except for May and December. Lunch is provided, followed by a technical presentation. Members are encouraged to participate by sharing experiences and expertise. Safety professionals as well as anyone interested in safety and health are welcome. On November 27th the members that attended the Safety Council were able to vote for the incoming Safety Council Co-Chairman. AGC would like to congratulate Jimmy DeAndrea for being voted in as the 2019 Co-Chairman. Vicente Rodriquez – Safety Manager of Glacier Construction Company, who has served as the Co-Chairman of the Safety Council in 2018 will succeed Perry Silvey – Safety Director at Iron Woman Construction, and become the Chairman in 2019. 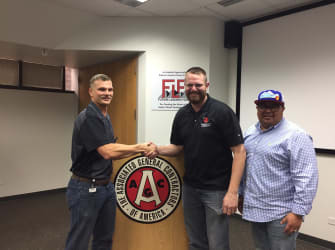 AGC would like to thank Perry Silvey for his leadership over the past two years. He was Co-Chairman in 2017 and then Chairman for 2018. Again, thank you to these 6 for showing interest in the Co-Chairman position. Download the handout from the November Safety Council Meeting.